Our facility offers a wide range of alcohol and drug rehab programs for individuals struggling from addiction, substance dependence and substance abuse. Our professional staff offer tailored addiction care programs that are personalized and effective to work for you. Whether you’re on our website for yourself or for a loved one, 1000 Islands Wellness is here to help. We can help you get the medical detox , drug rehab and addiction counselling needed to get your life on track. For more information on our programs, we’re only a phone call away. Our professionals are available to help around the clock. Addiction starts slowly in most cases but does eventually take over a person’s life. Someone who is addicted needs specialized care to enable them to recover from the addiction and get their life back to where they want it to be. At 1000 Islands Wellness, we offer specialized treatment programs for a variety of different addictions, so anyone who needs help can get what they need through us. We strive to assist all of those who are addicted so they have what they need to fully recover and start down a new path. If you or a loved one is suffering from an addiction, help is available. Once you’ve decided to seek out assistance for your addiction, we can create a personalized treatment plan for you. We offer numerous treatment options as well as on-site activities and other resources to enable you to regain the life you want to have. Contact us today to start working on your recovery. It can be difficult to decide to start working on recovery. If you are currently suffering from an addiction and you want to break free, a treatment program is recommended. At 1,000 Islands Wellness, we make sure you have everything you need to succeed in your recovery. We offer personalized treatment plans so you can make sure the treatment you receive is exactly what you need. We also offer medically supervised detox to ensure you can detox from drugs or alcohol as safely and comfortably as possible. If you have decided to start your recovery, give us a call today so we can let you know more about the treatments we offer and how you can start on the road to recovery right away. Deciding to go to a drug and alcohol rehab might be one of the most difficult parts of the recovery process, but once the decision has been made, treatment can enable you to recover from your addiction. We aid those with many different types of addictions, so you can use our services to get the right support and start working on your recovery and moving forward with your life. If you are on our site, chances are that you, a friend or loved one is struggling with addiction. 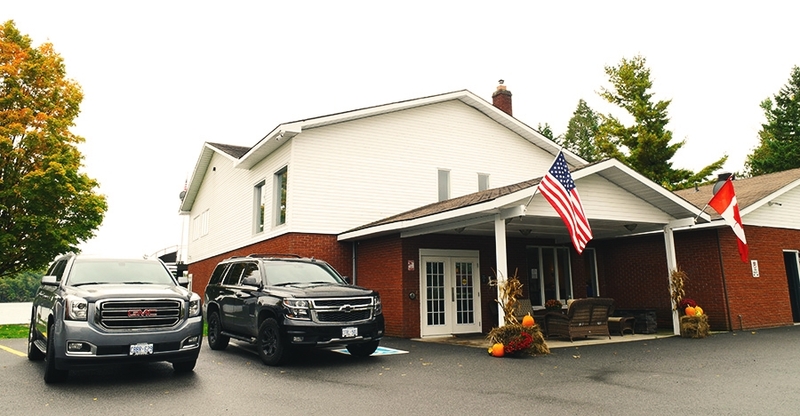 1000 Islands Wellness & Treatment Centre is one of North America’s most successful medical detox and addiction rehab facilities located in Eastern Ontario. Prescription Drug Addiction and Opioid Dependence are significant issues for Canadians who deal with pain management and the fallout of addiction to pain medication. Our Prescription Addiction Treatment programs begin with Medical Supervised detox and then transitions into holistic, therapeutic counselling programs to get you to recovery. Our Opioid therapeutic program is one of the most comprehensive in the world. Alcoholism and Alcohol Addiction continue to be one of the most challenging dependencies in Canada. Our Alcohol Addiction Treatment programs include Medical Detoxification and a detailed rehabilitation program designed for you. If you’re worried about a loved one who is suffering from an addiction, you may be wondering how to convince them to seek treatment. Many people will say that treatment will fail unless the person who is addicted wants to get treatment for their addiction. While this is true in some cases, interventions are often still something worth trying. While the person does need to want to recover from their addiction, they might not realize just how bad it’s gotten or realized they can reach out for help. We offer intervention services designed to equip you with the assistance to talk with your loved one about their addiction. We provide the assistance you need through the intervention to reach out to your loved one and get them to realize they do need treatment. Once they have decided they need addiction treatment and are ready to look into the options, we can get started working with them right away. We have dedicated professionals to speak with them and can give them information on what recovery will be like throughout treatment programs and what we can do for them. At 1000 Islands Wellness, we offer more than just a basic rehabilitation program. Our treatments are specialized so you can get the exact support you need. We make sure the treatment plan is designed specifically to meet your needs for you to recover from your addiction no matter what you are addicted to. We also offer counseling and therapy sessions so you can talk about your addictions, what you need more help with, and what you want for the future. We have holistic programs available, so you can learn yoga or meditation to aid in your recovery, and we offer on-site fitness programs. You can learn new skills like kayaking as well, so you have the relaxation you need to focus on your recovery, and so you learn new skills you can use when your treatment is completed. All of our staff is highly trained to aid you in your recovery and provide any assistance you might need during this time. When you’re nearing the end of your treatment, we provide support as you learn to transfer back to your daily life so it’s possible to reduce the chance of relapse. Our team provides top quality clinical and support programs that are specialized per addiction and tailored specifically to you. This includes a full care plan, group therapy and behavioral health. Drug and Alcohol Rehabilitation is just a call away. Our team of professional addiction specialists conists of experienced counsellors, nurses, physicians, therapists and holistic caregivers. Entrust your recovery to the best. Your rehabilitation program includes coaching and mentoring needed to cope with life after rehabilitation. These specialized programs provide ongoing aftercare and support. From our rigorous medical standards, to our highly trained staff. You can rest assured knowing that we are equipped to appropriately assist in any situation. We are a top rated Rehab in Ontario serving all of Canada and the United States. Located in the beautiful Thousand Islands region of Eastern Ontario, our centre offers dedicated professional addiction rehab programs tailored to our clients every need. This includes mentoring, ongoing aftercare and support. Let us help you take the first step to recovery. Depending on your addiction, you may need support in other areas of your life as well. On top of the treatments we offer for your addiction, we offer access to programs designed to teach you how to live after your addiction. Our staff can provide assist with setting up daily routines, teach you more about self-care, work with you as you learn to keep your living space clean and free from anything that could cause you issues after your recovery and teach you more about proper diet and nutrition. We want to make sure you have all of the skills you need when you leave our treatment program, so we offer many different classes and chances to learn more about the skills you’ll need when you leave. If you’re suffering from an addiction, no matter what you’re addicted to, and you’re ready to get help, you’ll need to go through the admission process. We require a few pre-requisites, such as being over the age of 18, and will need to talk with you about your addiction to ensure we can provide the right treatment plan for you. We will tell you more about what our treatment programs entail, let you know more about what to expect when you’re staying with us and will review what you should know before you begin your treatment. We want you to be successful, so we will start by giving you all of the information you’ll need to make sure this is the right place for you and to ensure you are motivated to start your recovery right now. 1000 Islands Wellness & Treatment Centre offers a comprehensive addictions rehabilitation programs for a wide range of conditions and dependencies. Our Wellness Centre offers drug and alcohol rehab programs designed for specific client needs serving Canada and North America through our Rehab in Ontario. Our goal is to save lives and create futures for our clients through long term recovery success. Addiction counselling and specific treatment is offered on a wide range of topics and underlying issues. Our addiction counsellors and medical staff work together on your individualized treatment program to ensure that success. Family life moving forward is very important and we will help you and your family members to understand what they can do to help you succeed. As a drug rehab and medical detox centre located in Eastern Ontario we serve clients throughout Canada and the United States. It’s all too easy to make the jump from enjoying a drink or two in the evening to needing to drink every day. Know the signs of alcohol addiction to be able to recognize if this is happening so treatment can be obtained faster. If you or a loved one is suffering from alcohol addiction, it’s important to go through a medical detox to safely stop drinking and avoid the harmful side effects that could occur. Our alcohol rehab program starts with the detox, then helps you or your loved one learn to stay away from alcohol to avoid further issues. We have dedicated professionals working with our clients to work with them as they recover from alcohol addictions and to ensure they receive all of the assistance they need through their recovery. Along with the detox, we offer various types of therapy, counseling, personal training, and holistic treatments. We also offer life management counseling to aid you or your loved one after the treatment program ends. Those who suffer from addictions to prescription medications often start with taking the medication as prescribed by their physician. Some medications, while very effective, can be addictive and those who start out taking the medications as prescribed may realize they’ve become addicted to the medications and are not able to stop taking them easily. In these cases, treatment programs can provide the support they need to stop taking the medications and look for other solutions to chronic pain or other medical issues. Symptoms of prescription medication addiction can include continuing to take medications when they aren’t needed, increasing the dosage or frequency, compulsive use, and more. If you or a loved one is suffering from prescription medication addiction, we can help. We offer a personalized treatment plan that looks into why you became addicted to the prescribed medications and what can be done to start your recovery. Our approach to treatment makes it easy for you to get assistance to stop taking prescription medications you no longer need to take. Though marijuana itself is not considered addictive, some people can become addicted to it just like alcohol. With marijuana being legal, more people are becoming addicted and finding it’s difficult to stop taking or smoking marijuana. When the use of marijuana starts to impact their health, their finances, or their daily life, it might be a good idea to look into the treatments available. At 1000 Islands Wellness, we offer treatment options designed for those who are suffering from marijuana addiction. Marijuana addictions are more common than previously thought, though most people may not realize how serious this kind of addiction may be. If you find it difficult to go a day or a few days without using marijuana or you find it’s impacting other areas of your life, treatment is an option. At our facilities, you can get the support you need to stop using marijuana and to get back to the life you want to have. We can provide assistance by offering a personalized treatment program designed to give you a better chance of being able to quit completely and start living your life again. Amphetamines are medications that are incredibly useful in treating several different conditions. However, they are also abused frequently. When they are abused, they are typically used as a stimulant. Those who use amphetamines frequently may suffer several symptoms and may find it’s difficult to stop taking the drug so they can live the life they want. If you are taking amphetamines or similar drugs, we have a treatment program that’s tailored to your needs. We offer specialized treatment for those who are addicted to amphetamines and who want to start recovering. Our treatment program starts with a medical detox to help you detox from amphetamines safely. We then work with you throughout your recovery to provide the treatment you need. We work on giving you all of the assistance you need to live your best life and make sure you can fully recover from your addiction. We can watch for signs you need medical aid during your detox and give you therapy and counseling sessions to get to the root of the issue as you learn to move forward without needing to take amphetamines again. Heroin is one drug that is very addicting, with many users becoming addicted within the first few weeks of trying it regularly. When someone is addicted to heroin, it can impact their entire life and cause many issues throughout their daily life. Many times, once the person is addicted, they will lose their job, start having financial issues and may resort to illegal activities to get more heroin. Despite how addictive this substance is, there is addiction treatment available if you or a loved one is addicted to heroin. At 1000 Islands Wellness, we are well prepared to assist you in the recovery from heroin addiction. We can work with you to manage the symptoms of your addiction while you go through a medical detox, then create a personalized treatment plan to ensure you get all of the support you need through the recovery. We work closely with you to make sure you can recover from your addiction to heroin and learn how to get the life you want. Our goal is for you to fully recover so you can get your life back on track. The path to addiction is never the same for each person. There are many factors that may contribute to dependence on drugs or alcohol. This means that everyone needs rehabilitation programs that are designed for their specific needs. 1000 Islands Wellness and Treatment Centre offers professional treatment programs for individuals struggling with addiction and substance dependence. © 2019 1000 Islands Wellness . All rights reserved.